I wreck my brain about asparagus. I know you must be puzzled, why?! Asparagus, you must think (You must! :), is a majestic, European native, perennial ingredient, why the frustration?! Truth be told I just want to fancy it up, but I always come back to square one, roasting it in the simplest form with a touch of olive oil, salt and lemon. Not even freshly ground black pepper. This method and bare bone seasoning purely highlights the tenderness of the ingredient. Especially now that it's in season and the green, purple and white spears appear all over at farmers markets. Once in a while to slightly jazz it up I will sprinkle za'atar over it just before serving. Za'atar, a Middle Eastern spice blend, not the protected fresh herb Majorana Syriaca that goes by the same name (Food Bridge wrote about it here). Za'atar, the thyme, sumac, sesame seeds among other ingredients mix, can be found in Middle Eastern markets as well as at Whole Foods. Other mainstream supermarkets might carry it too. The sumac, one of the ingredients in Za'atar, is a ground red berry from a shrub. It's tangy, lemony in flavor. Don't go foraging for it without an expert field guide as some of the species are toxic. You can also find it already ground in Middle Eastern markets. 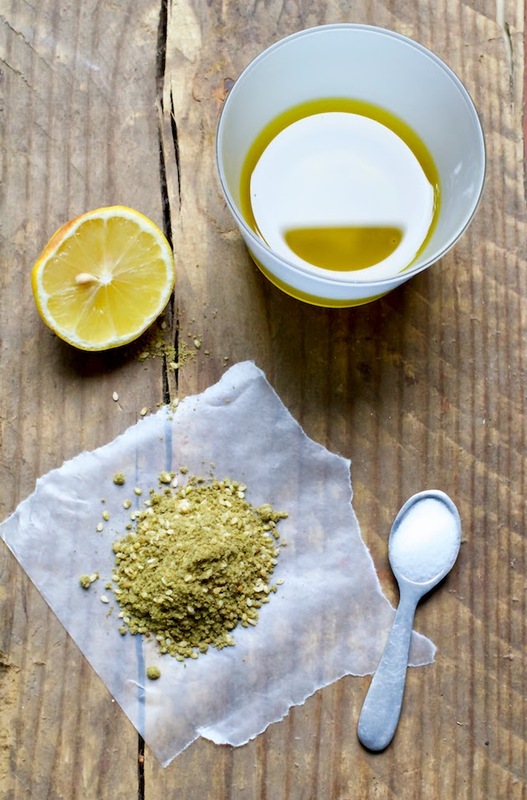 If you wish to make za'atar from scratch, you can find a couple recipes here and here. Here and there I make asparagus this way with avocado dressing and grated hard boiled eggs, substituting the broccolini with the asparagus. Ottolenghi has another simple version with capers and eggs here. I even made this lemon dill aioli, which I adore, to go with it, or you can make this za'atar aioli I found over at Epicurious. Quick tip on how to trim asparagus at The Kitchn. I was looking for this video I watched years ago on how to gauge where exactly to snip the asparagus but I couldn't find it. If you find it, link in the comment section below. Thank you. Pre-heat oven to 400F. Snip or slice tough bottom tips of asparagus. Peel the bottom tips of the stalks as shown in photo, if you wish. Toss with olive oil and salt and layer on a parchment paper lined cookie sheet. Roast for 20 minutes while giving the asparagus a toss at the 15 minute mark. Add the lemon and zaatar. Once done, serve immediately warm or at room temperature. Keep in mind that if adding Za'atar it already has salt in the mixture. Ovens vary. I like mine cooked for 20 minutes, if you like asparagus crunchier, reduce the roasting time. 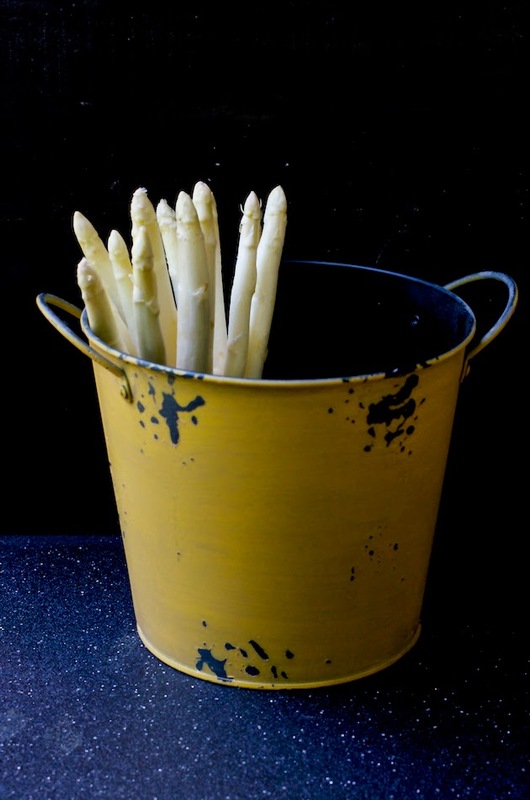 A wonderful way of preparing asparagus! A simple, yet extremely refined dish. I saw you tweet about these asparagus the other day. I'm with you...I sometimes what more to do with them instead of realizing immediately that they are so wonderful enjoy simply! Gorgeous photo, Shulie!! So curious about Za'tar. This sounds like a fantastic way to try it. I can not get enough of roasted asparagus! The white is perfect as well! Roasted asparagus just happens to be one of my favorite things in the summer! The white are just as wonderful! This is the only way I'll eat my green veggies - roasted perfectly like this! 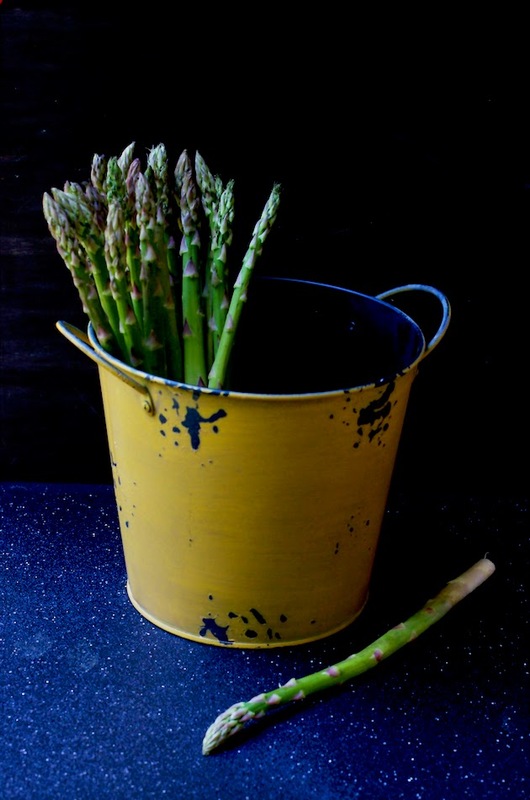 Perfect timing as fresh asparagus is plentiful right now and such a favorite! I must admit that I've not yet tried Za'atar. I've meant to, but somehow it just hasn't found its way into my kitchen. The lemon-dill aioli you mentioned also sounds delicious! Your photos are simply breath taking! I love asparagus and make it almost every week! I will definitely try this recipe! I've not met an asparagus I didn't like. I can't wait to try adding Za'atar next time. 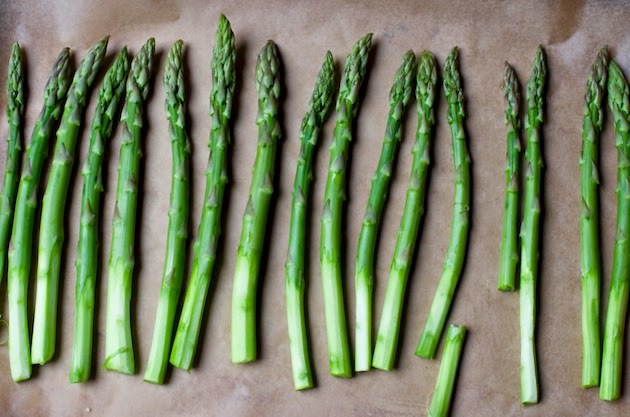 Nothing is better than springtime asparagus. Nothing! Lovely photos too, Shulie!! 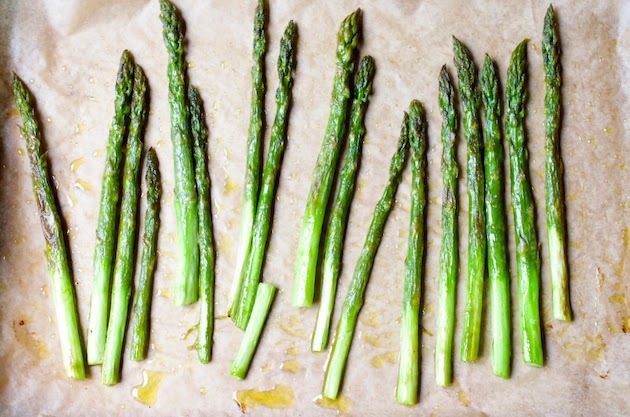 Simple roasted asparagus is my favorite, too. The za'atar would certainly jazz things up a little. Lemon and asparagus sounds sooo good!! Simple is always best - thanks for sharing this recipe!! 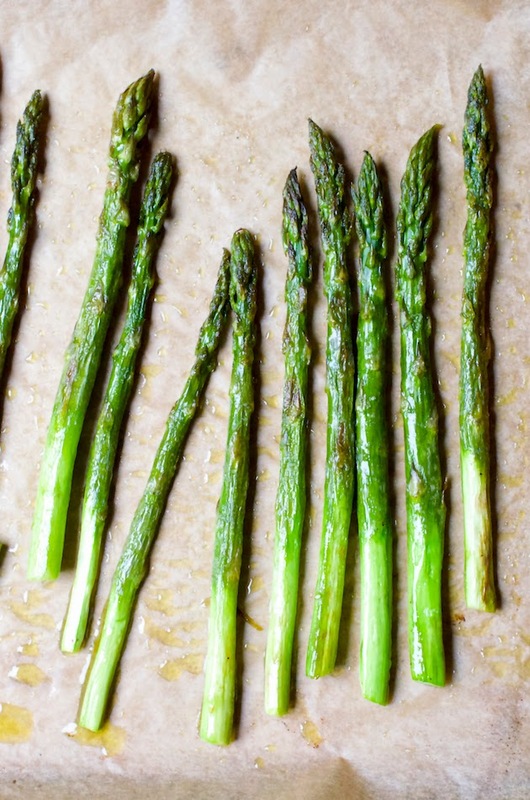 I roasted asparagus for dinner tonight...and all I add is olive oil, salt and pepper. I finally have some za'atar in the house, so I will have to give it a sprinkle! Shulie, no need for fancy when it comes to asparagus... what you've done is perfection!